Dave Rose runs Deep South Entertainment, a successful business and artist management company that’s been around since 1995. Over the years, he’s worked with some big names, including Michael Sweet, Bruce Hornsby, Marcy Playground and Allison Moorer, to name just a few. Rose’s own musical journey began as others often do: with a guitar and a dream. But shortly after he began regularly performing in bands, he discovered his true calling relied less on the art of making music and more on the act of helping others learn from the experiences he’s had. Thankfully, he’s shared that knowledge in an amazing new book. Everything I Know About The Music Business I Learned From My Cousin Rick: The Musician’s Practical Guide To Success is a mouthful of a title, but it’s also one of the best books a musician can read on how to really become successful in their craft and enjoy the moments along the way. 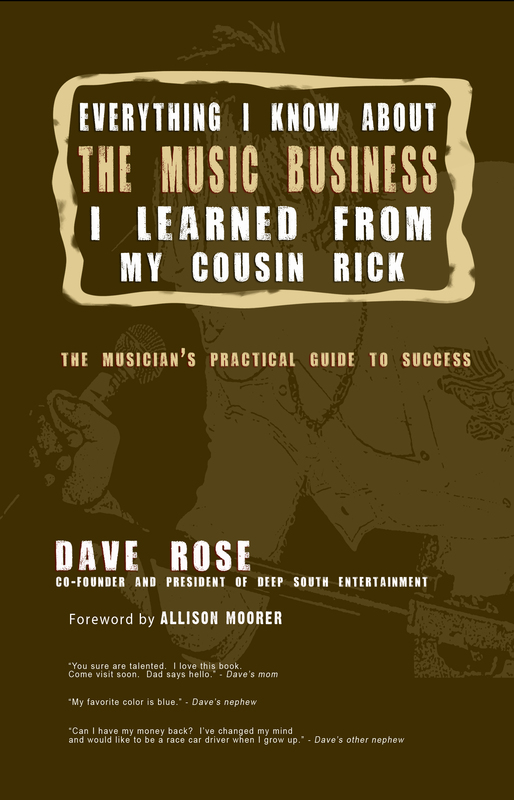 Based upon the epiphany he had when his cousin (Rick) played him the first Boston album, Rose’s book is part “biography” and part “how-to.” It’s also a valuable resource for musicians of all levels. If it’s something a band is going through now — or has done in the past, Rose has been through it. From writing songs and booking gigs to recording albums and creating a fan base, Rose shows you how to achieve real success in music. Success that’s not measured by the number of albums sold or the money earned from gigs, but rather from the goal that anyone who’s ever picked up an instrument should have in the first place: the desire to make great music. Novice musicians will find plenty of informative information on things to avoid when building up their band; while those with more experience may find themselves looking into a mirror at times as they turn the pages. In either case, Dave’s book is a fast, fun read. I had the chance to speak with Dave about his new book and some of the lessons he’s learned along the way. – Read the complete article here.